1. Reduced street cleaning- It is vitally important that the clearing of broken glass and debris from cycle lanes (and cycle routes generally) is not reduced, as punctures are a major disincentive to cycle use, particularly among children and adults returning to cycling. 2. Less reactive maintenance to street lighting- This should be achieved by using more reliable lighting (eg LED), not by removing illumination from signs, where this is essential for road safety or will reduce motorist’s awareness of cycles, eg at cycle contra flows. 3. Increased enforcement of moving traffic offences- This is welcome and should include 20mph and ASL enforcement. 4. Reductions in back office technical and administrative support- Please confirm this will not lead to a reduction in road planning and engineering staff needed for implementation of Corporate Plan Priority 3. 5. Planning – Changes to Policy and Practice remove non-statutory consultationPlease confirm this will not reduce consultation with environmental action groups such as ourselves and Living Streets. 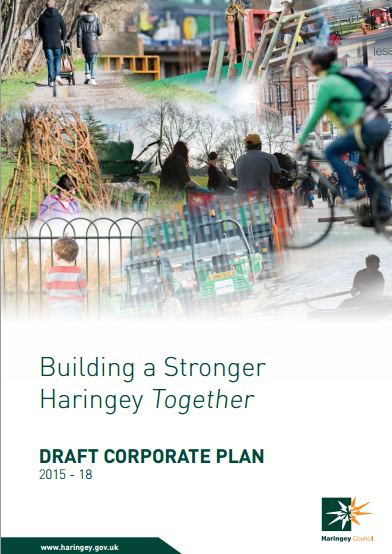 Priority 3: Clean, Green and Safe A clean and safe borough where people are proud to live We will make Haringey one of the most cycling and pedestrian friendly boroughs in London. We will promote and improve cycling and walking, which will include introducing a borough wide 20mph limit, increasing the network of cycle routes and dedicated cycle lanes and providing a smarter travel campaign to persuade people to use sustainable modes of transport. 1. We will promote and improving cycling and walking in the borough. This will include introducing a borough-wide 20mph limit, providing more cycle racks, increasing the network of cycle routes and dedicated cycle lanes, providing more cycle training, improved signage, and safety measures on priority pedestrian crossings, and launching a smarter travel campaign to change behaviours and get more people to use sustainable modes of transport. All road improvement schemes will be assessed for pedestrian and cycle safety. I hope these small changes in wording can be included.